With the Sunmodule Plus, SolarWorld AG presents an innovative module concept. The Sunmodule Plus is produced in state-of-the-art, fully automated production facilities, meeting the highest possible quality standards. Our Sunmodule Plus modules guarantee consistent output and set themselves apart with their outstanding product features. The SolarWorld modules Plus sort system is unique. The performance of every individual module is determined with oversized “flashers”. The modules are then sorted in 5-watt steps, making the time-consuming process of sorting the modules on-site unnecessary. Only those modules that have been “flashed” with the specified amount of rated power (or more) are supplied to customers. CTI stocks both Monocrystlline and Polycrystlline PV modules which are 100% Origin German manufactured, We proudly say that these modules are the best solar panels available in Pakistan. which are completely PID free, Salt Mist Corrosion resistant, Ammonia resistant and highly resistant to dust and sand (desert proof). furthermore Solarworld is the only Tier 1 manufacturer to be rated excellent in the PV + test 2.0 conducted by TUV, also Qualified IEC 61215 & IEC 61330. We would keen on exploring on a potential business relationship, please let me know how we can assist you with our high quality products and services. 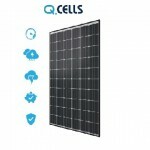 GERMAN QUALITY BACKED BY KOREAN FINANCIAL STRENGTH FOR HANWHA Q CELLS, PHOTOVOLTAIC TECHNOLOGY IS NOT JUST A PRODUCT. IT IS THE KEY TO RELIABLE, POWERFUL, AND SUSTAINABLE ENERGY SUPPLY – TODAY AND FOR FUTURE GENERATIONS. financially and technologically for the future. best solar product in Pakistan, solar solutions pakistan, solar solutions in lahore, solar system in pakistan, solar system in pakistan price, solar panel price in pakistan, solar energy system prices in pakistan, solar panel rates in lahore, solar energy system prices in pakistan, solar panel cost per watt, best solar panel in pakistan, world’s no 1 solar panel in pakistan, world’s best solar plate, free bijli in pakistan, IEC 61215, IEC 61730, ISO certified solar panel in Pakistan.